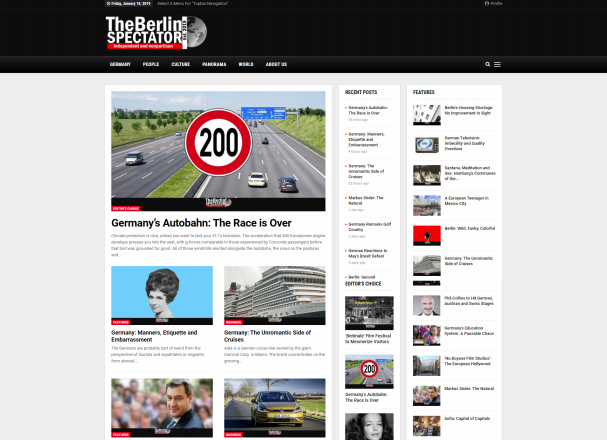 The Berlin Spectator is an English-language news and features site about Germany. This publication is being made for expatriates, but also people around the world who are interested in the country, as well as Germans. In articles, features and video reports, we will cover the most relevant news from Germany, while not forgetting about cultural and social subjects either. The expatriates themselves will be in the center of our attention too. This publication will also introduce German personalities. Yet another task for The Berlin Spectator is to explain Germany and the Germans to those who have just moved to the country or are planning to do so. And to everyone else interested. On top of all of the above, entertainment will be an important aspect. We have our very own way of creating interest and bringing the story across, as you will see. At this stage, we are in the process of setting up this site. Please bear with us. By the way: In case you find pieces written and published before our launch date: They were part of our test site, Publication79, which is now integrated into The Berlin Spectator. Imanuel Marcus is the driving force behind this project and the editor-in-chief. He used to be a radio presenter and editor before becoming a correspondent for German and Swiss radio stations in former Yugoslavia and the United States of America. Some four years ago, he returned to journalism after a long break, by reporting about the unfolding refugee crisis from Croatia and Bulgaria. Also he got into writing for online media in Eastern Europe. Back in Germany, The Berlin Spectator is the project he is jump-starting as we speak. We thank you for your interest. In order to support us, please keep on following and reading The Berlin Spectator. And please spread articles or features you like by posting them on social media or forwarding them to your friends and family. Thank you very much indeed. In case you want to support this publication financially as well, there will be ways to do so which we will introduce in due course. In the long term, a publication like this one will only be able to thrive and survive with advertising and contributions. Thank you yet again for visiting The Berlin Spectator. Please feel free to contact us with any comments or questions you might have. The Berlin Spectator is an independent and nonpartisan publication which delivers its content while adhering to the main principles of journalism, including accuracy, fairness and impartiality. This publication upholds values such as democracy, freedom and the so-called Liberal Democratic Basic Order, which is part of the constitution of the country we are based in. Our reports are accurate and informed. Should there be sponsored content, it will be clearly marked. This means all pieces not marked as sponsored are actually not sponsored. The Berlin Spectator firmly rejects racism, homophobia, antisemitism and violence, but promotes tolerance. We also reject conspiracy theories about global warming, ethnic groups, peoples and countries. Our legal notices page can be found here.